The John Deere Historic Site opened its gates to the public for its 55th season on Friday, March 1. 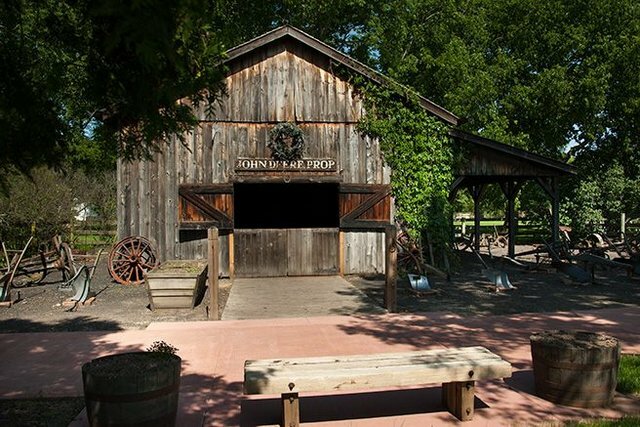 Located in Grand Detour, the site is the original Illinois homestead of John Deere and is the location where he built his first “self-scouring” steel plow. The attraction is open daily through December and always offers free admission. Blacksmith Shop: A highlight of any visit to the site includes seeing a recreation of Deere’s original blacksmith shop. Entering is like a time warp to early pioneer days as guests see the shop as it would have looked over a century ago. Generally, five to seven times a day, resident blacksmiths demonstrate what it takes to be a skilled iron worker. Works created by the blacksmiths are sold in the site’s Gift Shop along with a variety of John Deere licensed products. Deere Family Home: The original home John Deere built in 1836 gives an intimate glimpse of pioneer life. Visitors see how the Deere family raised eight children, not to mention live-in apprentices, in their six-room home. See the rooms as the Deere family would have known them, furnished with period household items that show how pioneers cooked, cleaned, bathed, and spent their few leisure hours. Archeological Site: In 1963, an archeological team uncovered the exact location where John Deere forged his first self-scouring steel plow. While looking over the preserved site and seeing firsthand the artifacts excavated, a video tells the story of how John Deere built a thriving manufacturing business. Gift Shop: This one-of-a-kind gift shop sells hand-forged items made in the blacksmith shop. A selection of John Deere licensed items and other John Deere Historic Site merchandise is available. Plan your trip to the John Deere Historic Site around one of the many special events we have scheduled throughout the year. Enjoy musical performances by local bands, visit pioneer-era crafting demonstrations, and check out food trucks. Visit with hundreds of vintage John Deere tractor owners (pre-1979 machines) displaying their collections on the grounds of the Historic Site. This event features a tractor parade through the streets of Grand Detour at 7:00 p.m. on Saturday, August 3. A celebration of the harvest season where kids can decorate pumpkins, bob for apples, ride in a covered wagon, or visit with farm animals. Cookies and hot cocoa provided for all. The John Deere Historic Site is open seasonally March 1 through December 31. Gates open daily, from 9:00am – 5:00pm, Monday-Saturday. Noon- 4pm Sunday. Admission is free. For more great info on John Deere, click this link. Hurry! Before it’s too late!